Stop the slavery? How to help employees who complain about too much work. 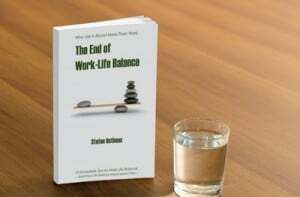 It is crazy: Your desk is loaded with work and your work list in the office is getting longer and longer? Have tasks been sneaking onto that list for years? Unfortunately, work lists can be like attics and sheds—things get in there and they tend to stay. Bring the concept of spring cleaning to your work and see if you can clean out unnecessary tasks from your list (and your team’s) to save some time. It might seem like an odd question, but an important one to consider. The most obvious answer is that your work should benefit your employer. The company will either benefit from your innovation when you create new ideas or concepts, or see its established processes being maintained when you operate within predefined precepts. So if it’s your employer who benefits from your innovation and maintenance, what is the benefit for you? Beyond monetary compensation, your work should bring you reputation and satisfaction – ideally both. A task can add to your reputation if your good work gets noticed. A task can also add to your satisfaction if it’s something you’re good at and that you thoroughly enjoy doing. 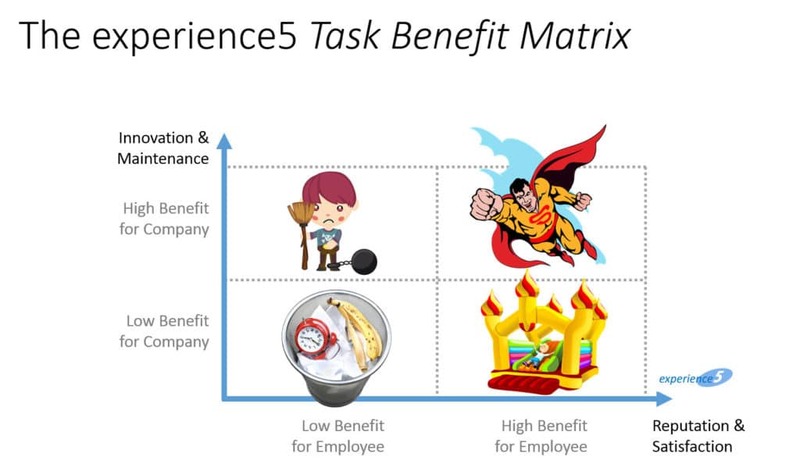 To get into the desired Superman quadrant, you should focus on tasks that equally benefit your employer as well as yourself. This is the area where you’re making a real contribution and enjoying yourself in the process. After a day spent in this quadrant you go home feeling energized, satisfied, and proud of what you have achieved. Some employees might also be drawn to the top left quadrant where they see equal benefit in terms of innovation or maintenance. However, your benefit here is minimal. Work in this quadrant drains your energy rather than providing positive stimulus. After a day spent on work in this quadrant you may go home feeling happy for what you have contributed to your company, but you will be tired, frustrated, and drained of energy, which probably doesn’t make you a fun person to spend the evening with. Tasks that add a lot of benefit to your company and little to yourself should not be on your task list. You should either delegate these tasks to others in your organization who ideally enjoy these tasks much more or are better suited to perform them. Alternatively, consider outsourcing these tasks to vendors. In the bottom right quadrant you find tasks that benefit you, but contribute very little to your company. One example of tasks in this area are so-called pet tasks, functions you perform well and enjoy doing, but which are not in line with your current level in the organization anymore. You need to let go of these by delegating them downwards in your team. They do provide benefit to your company, but you are definitely the wrong person to perform them. If the task you thoroughly enjoy adds no benefit to your company, it’s a hobby. Don’t do it at work. The bottom left quadrant on our chart is the black hole of wasting time. Tasks performed here benefit neither your employer nor yourself. Maintaining overly bureaucratic processes are one example. Surfing the web beyond what is needed for research or a short break is another. Several surveys estimate that the amount of time wasted at work is between five and ten percent. Eliminate the tasks that fall into this quadrant to free up time you need for improving your life balance. Now that you have cleaned up your work list, make sure it doesn’t clog up again. Mark time in your calendar regularly; say once every six months, to repeat this spring cleaning and keep your work list well-defined and crisp. Also, make it a routine to go through this exercise with your team so that tasks can’t pile-up and clog the performance in your department or group.